Earn the full 100% completion and unlock the sole ending for the From the Dead chapter of Detroit: Become Human. 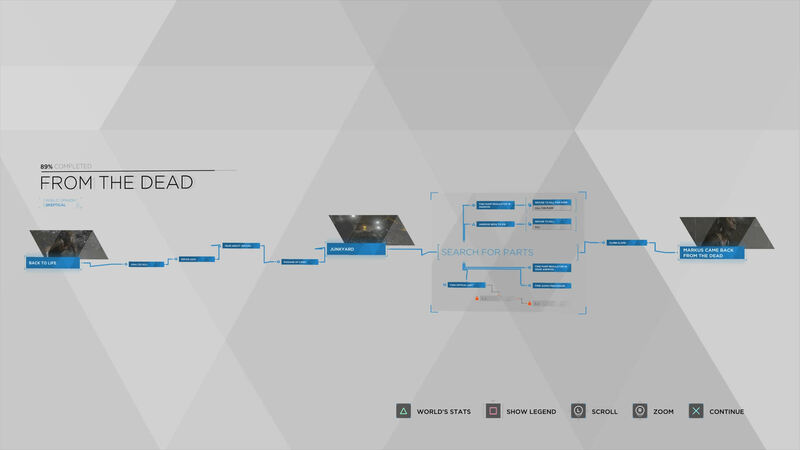 The following guide will break down all the actions, decisions, and events needed to earn a 100% completion ranking in the Detroit: Become Human chapter From the Dead. This is one of the more straightforward missions in the game, offering but one distinct ending. Our so-far 89% complete flowchart for From the Dead. Players should have no trouble reaching 100% completion on From the Dead. There's just one ending to the chapter, and only two decision branches to be found with regard to how Markus can find the pump regulator he needs. There's but one ending to Back to Life, and as players might expect, it involves Markus scavenging for the parts he needs to restore himself to working order. No matter which choice players make with regard to the pleading android, all paths will lead straight to this one ending. Now that From the Dead has been 100% completed and all endings have been earned, players can move on to the game's next chapter Waiting for Hank. To learn more about the game's other chapters and the completion and ending requirements therein, be sure to head over to our Detroit: Become Human walkthrough and guide.